These days, every Arnold Schwarzenegger performance is a battle between the present and the past: To watch the Austrian muscleman play his advancing years for comedy (the Expendables series) or pathos (the recent Maggie) is to see a once-herculean action star acknowledge that he’s not the perfect human specimen he used to be. Terminator Genisys, the fifth installment in the blockbuster franchise James Cameron abandoned almost 25 years ago, comes close to making that conflict literal. In one corner, you have current Ahnold, back in biker black to reprise his most iconic role, the relentless and re-programmable T-800. In the other, you have the spitting digital image of his younger self, a phantom foe plucked straight out of 1984. Forget logistics for a second and just marvel at the house-of-mirrors spectacle of Schwarzenegger whaling on Schwarzenegger. It’s an even more crowd-pleasing title fight than the one that closes Jurassic World, this summer’s other extended nostalgia trip to the dawn of the CGI era. The comparison is instructive: Both Genisys and Jurassic take a fan-fiction approach to rejuvenating their brands, echoing popular early installments while completely disregarding the continuity of less-popular later ones. (At least they’ve got an excuse here—the retconning possibilities of time travel, which allow for whole stories to be wiped clean.) This new Terminator, the first since the dreadfully dreary and Arnold-less Salvation, is engineered to feel at once eerily familiar and raise-the-stakes fresh. Part sequel, part reboot, it gives us a car chase and a helicopter fight, an explosive attack on a lab and a visit to a weapons stash, “I’ll be back” and, “Come with me if you want to live.” It also re-deploys that menacing mound of metallic goo, the T-1000. 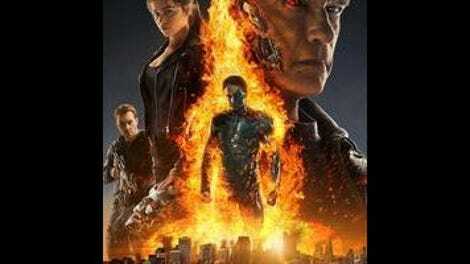 Incidentally, the movie itself is something of a T-1000, traveling back in time to mechanically replicate what it isn’t. If you’ve seen Cameron’s gritty original, you know how things start: In a future ruled by sentient killing machines, leader of the human resistance John Connor (Jason Clarke, walking in the footsteps of Edward Furlong, Nick Stahl, and Christian Bale) sends his most trusted soldier, Kyle Reese (Jai Courtney, filling in for Michael Biehn), into the past to protect his mother from the cyborgs. It’s when the buck-naked traveler arrives in Los Angeles, circa the 1984 of the first film, that Genisys goes off script. Turns out Reese has landed in a past that’s already been altered, where Sarah Connor (Emilia Clarke, bringing that Daenerys determination) has gone Linda Hamilton badass way ahead of schedule, thanks mostly to a childhood spent under the care of a T-800 she calls Pops. 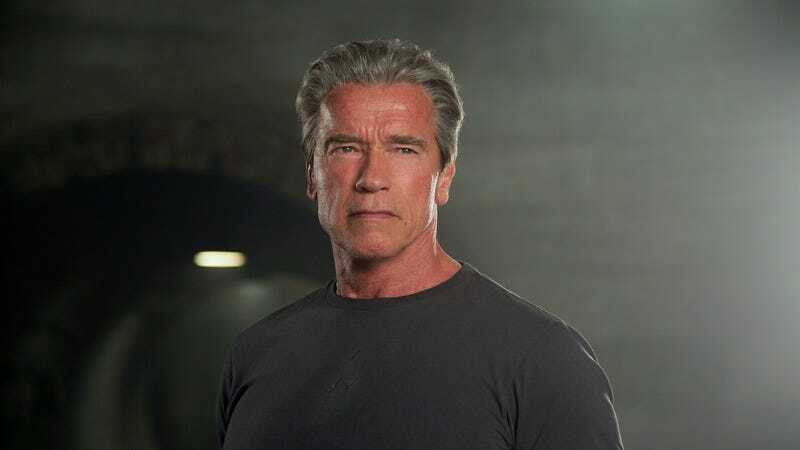 The script helpfully explains that Terminator tissue ages just like the human kind, which conveniently accounts for the wear and tear on Schwarzenegger’s pushing-70 physique. Genisys, whose misspelled subtitle refers to the advanced operating system that will eventually become Skynet, takes a Back To The Future Part II approach, sending characters careening from 2029 to 1984 to 2017. There are intersecting timelines, memories of alternate pasts, and flashbacks to future events. The film smartly masks its convoluted exposition with humor: “Time travel makes my head hurt,” Reese groans as Pops rattles on about quantum this and nexus that. J.K. Simmons also drops by for some effortless comic relief, playing a beat cop who spends three decades obsessing about the time he saw a kill bot in action. He’s our audience surrogate, nerding out as all hell breaks loose. These fighters for the future, humanity’s last hope in the battle against Skynet, seem less stoically burdened than the ones Cameron introduced in his one-two punch of sci-fi-action mastery. There’s an almost screwball levity to their interactions: Courtney and Emilia Clarke circle each other with a who’s-saving-who flirtatiousness, while Schwarzenegger’s conspicuously nicknamed machine watches like a concerned father from the sidelines. Genisys, more than its predecessors, seems vaguely self-aware of how dysfunctional, how perverse even, Terminator’s central relationships are. This is a series, remember, where a man sends his best friend back in time to put the moves on his mother, engineering his own conception. Here, screenwriters Laeta Kalogridis and Patrick Lussier add a new 12 Monkeys wrinkle to that matchmaking design. It gets weird. The film moves so fast—an explanatory prologue, a big battle scene, and Reese jumping through time are all covered before the opening credits have finished rolling—that it’s easy to overlook how weightless most of it is. Director Alan Taylor, who made the second Thor film and several episodes of Game Of Thrones, keeps the conveyor belt of CGI-abetted action running at all times; those who come hoping to see a bus do a flip or a shape-shifting robot melted by acid won’t leave disappointed. But Taylor lacks Cameron’s sheer virtuosity, his gift for integrating digital spectacle into a physical world—which wouldn’t be such a huge deal if the film wasn’t constantly tweaking and re-staging key set pieces from Terminator 2. Again, we’re in Jurassic World territory here, with a director nodding to a seminal special effects movie he hasn’t the chops to equal. But Judgment Day wasn’t just a pillar of studio escapism, the kind of thrill machine that summer movies have been aspiring to ever since. It was also an oddly touching doomsday family drama, one that maybe even earned—in its cathartic climax—the tears the T-800 couldn’t cry. Genisys, by contrast, is just empty fan service, a perfectly watchable facsimile that never instructs its audience to feel anything except a fondness for the older movies it recalls. When one character flips allegiances halfway through the film, the change of heart packs no emotional wallop, just the quick sting of a plot twist. The only real resonance is in the sight of a sexagenarian action idol boldly resisting retirement, one robot slugfest at a time. “I am old, not obsolete,” Schwarzenegger insists throughout, in what handily serves as a mission statement for his post-politics acting career. If but this franchise extension—fleet, shiny, forgettable—could fend off its own obsolescence.